When you optimize your Web site for search engines, there are several tools you can use to analyze your Web page content to make sure you’ve set up your keywords effectively. They offer shortcuts that show you some key factors that the search engines look for to determine relevance. Remember, in almost every case, the search engines themselves are going to be your best asset in terms of analyzing your market. Page Analyzer: The Page Analyzer is your primary keyword analysis tool. It lists all keywords on the page (words used at least twice, minus “stop” words like the, and, but, and so on). It shows you each keyword’s density and frequency. It also identifies problems in your Title tag and Meta tags and analyzes the reading level of your text. 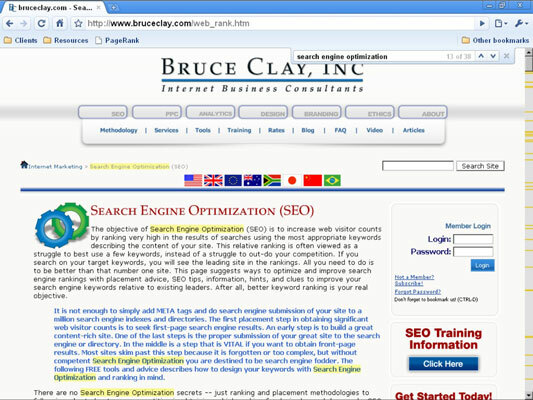 Copyscape: This free tool lets you check for duplicates of your Web page copy elsewhere on the Web. You want to make sure you have original content on your site because duplications can cause your page to be filtered out of the search engine’s index. Wordtracker is a for-pay tool that measures keyword traffic. Wordtracker offers both annual plans and monthly plans. The annual subscription runs about $329, and the monthly plan costs $59. They also offer a free trial version. Keyword distribution using a browser: Two excellent browsers for this purpose are Mozilla Firefox and Google Chrome. Available as a free download, Mozilla’s Firefox browser is one of the most powerful SEO tools out there, with multiple add-ons that allow power users to slice and dice almost any aspect of a Web site. Right out of the box, Firefox lets you do a rough keyword distribution search on a page. Ctrl+F brings up a search box: Just type in your keyword, and then select Highlight All to see where the words fall on your page. Google Chrome lets you see a word’s linear distribution using colored banding in the scroll bar. Also available as a free download, Google’s new Chrome browser has some nifty features. One of its best features is the ability to see how a word or phrase is distributed throughout a page visually. With any Web page open, simply press Ctrl+F to activate a drop-down search box. Then type in the word or phrase you want to find. The above figure shows how every instance is automatically highlighted in yellow, and colored bands appear in the vertical scroll bar representing each time the selected word or phrase is used in the page content. Seeing a keyword’s distribution at a glance like this can help you distribute it evenly throughout your page. Google synonym search: Search using a tilde (~) character in front of one or more of your words, and Google displays those search terms and their synonyms, commonly associated, and related words in bold on the results page. This can be an excellent way to discover additional words you can optimize for on your Web page.